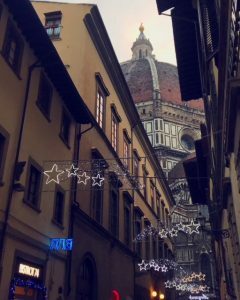 As my last few days in Florence came to an end, I found myself feeling two polar opposite emotions. Half of me felt more than ready to get home back to the United States where I would be reunited with my family and friends, no longer worry about not knowing how to speak the language and indulge in all the American food I had been missing. But the other half was very, very sad. I spent an entire semester in a foreign place and had made it my home. I would no longer wake up and see the smiling faces of the men who worked at the sandwich shop below my apartment. I would not pass the view of the Duomo on the way to class or walk on the cobblestoned streets anymore. I couldn’t walk down the street to my favorite sandwich shop to get my “usual.” I knew that as much as I miss my friends and family back home, I would miss Florence just as much. Although four months did not seem that long to be living somewhere, it taught me a lot about myself and also about my view of the world. 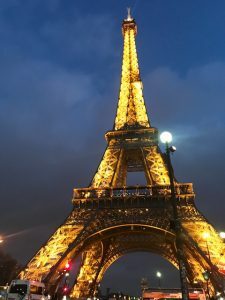 Before going abroad, I was very uneasy about traveling alone and trying things I haven’t before. Having this semester away from the United States was like experiencing something new each and every day. I had to learn how to communicate with people of all different nationalities. I had to navigate my way around the city and figure out acceptable behavior for certain cultures. Every place I traveled to had different social norms that can’t really be explained by words. But by going to new places, and learning how they do life, helps put into perspective how truly different everyone is and how important it is to respect different cultures. 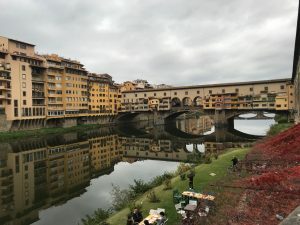 Gaining independence has been one of my biggest take-aways from studying in Florence. I’m not sure at what point in the journey I became “more independent” or if it just gradually happened over time, but from this experience I can say that I am a lot more comfortable being on my own and figuring things out by myself. Between traveling alone and figuring my way around of a completely new country, it became easier to no rely on other people for help. Of course, I had my friends to lean on throughout the journey, which I truly wouldn’t have survived without. But as much as I enjoyed traveling with them and experiencing life abroad I just as much enjoyed doing things on my own. 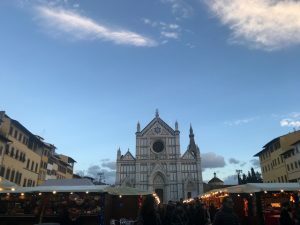 One of my favorite things to do after class was to sit in a square, whether it was Piazza Santa Croce or Piazza della Signoria and take in what was in front of me. Sometimes I would draw or write, but other times I would just watch and observe what people were doing. This can seem boring but it became something I looked forward to every week. If I were ever having a bad day or missing home it reminded me just how beautiful the city was and how grateful I was to be experiencing something that was once in a lifetime. Eating alone became another one of my favorite things that used to be one of my biggest fears. The thought of sitting in a room of people all conversing with someone else while you’re sitting alone worrying what they’re thinking of you was awful to me. 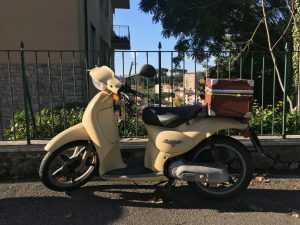 It may be because more people than not eat alone in Italy, but this fear of mine vanished. Eating alone became the perfect alone time I needed to recap on my day or to work on school work that needed to be finished. Now, after not being back home for 24 hours yet, I can already sense myself missing the beautiful streets of Italy and wanting to be back for another semester. I can only hope that years down the road I’m able to travel back and see the streets that I used to walk to class to and remember how great my time was. Siobhan was a Fall 2017 SAI Florence student from Muhlenberg College.